These examples of out put, are from a version compiled for a deep sub sea methanol injection system, 6.25 miles/10 kilometers to the well-head. 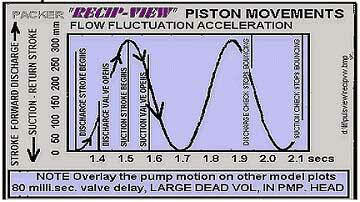 Flow was generated by a multi-layer diaphragm head pump, against a total system resistance at the pump, of 700 Bar. 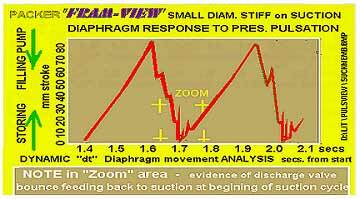 relate each set to "RECIP-VIEW" piston position. B. 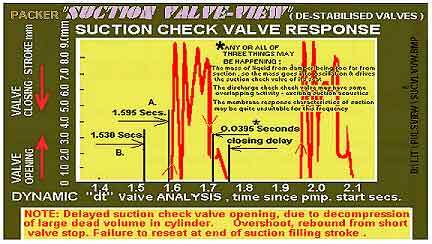 See "RECIP_VIEW", When Suction Valve should open. 1. The liquid mass between damper and suction is too long. Slugs are going into oscillation and driving the checks off their seats. 2. 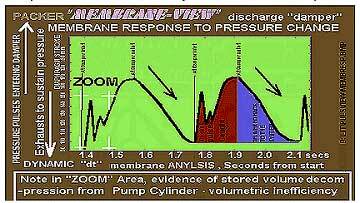 Membrane response characteristics of suction damper may be unsuitable for this frequency. 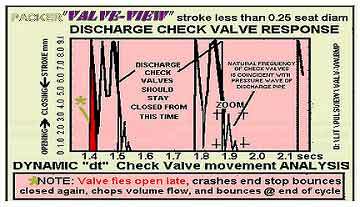 In a system with a reciprocating pump, the root cause of the great majority of problems, begin with suction check valve response opening and closing delay. 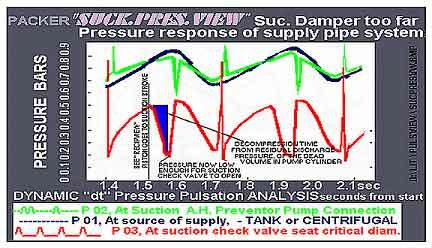 This is always found to be caused by the compressibility, SG, & cP of the system liquid, and the pipe design coming to the pump. The most common problem is too much suction force. Next are oversized suction pipes, and frequently interaction / interconnection between pumps or between individual check valve pockets. Please see pages 34 & 35.
will keep systems out of trouble.